Something different with a lot of atmosphere (not just from steam). The loco is obvious enough - 'Problem' No. 77 Mersey. As there are coal rails on the tender, the date must be after mid 1895. 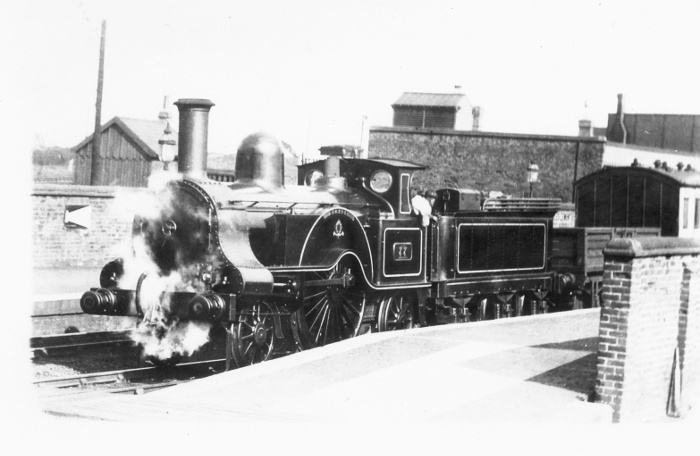 But the date can be refined further, as Baxter shows the engine to have been rebuilt into its final form, as seen here, in March 1896 and withdrawn in January 1907. But where is it? Someone has written on the back of the photograph 'L&Y', so that might be a clue, And what is the first vehicle behind the engine? The first vehicle behind the tender is an 21ft 0in Open Fish Truck to D.468. There were a total of 255 of these built, the majority from from 1889 to 1901 (on channel steel frames to 1899, bulb-iron frames thereafter � this one has channel frames with curved headstock ends) but amazingly 7 were built as late as 1922, 6 on capital account and one special renewal. 207 remained in capital stock in 1923, plus seven duplicates. There were still 41 running in 1933 and the type was extinct in 11/58. I find this extraordinary as my understanding is that the conveyance of boxed fish in open trucks ceased in the 1920s. The coach with a lavatory at the end adjacent to an entrance door is a Saloon. The large building behind the tender is most odd � flat roofed in 1900? At a guess the location is the Fylde. The date seems to be before 1903, because of the "ordinary passenger train" headcode in use before that date - one white light over the left-side buffer. According to Edward Little, who lived at Bicester at the time and took a keen interest, No 77 'Mersey' was shedded at Bletchley from around the end of 1905 until it was withdrawn for scrapping about the end of September 1906. He says (SLS Journal, May 1952) that this engine gave him his fastest run ever from Bicester to Bletchley "with the usual five-coach train". Earlier it had been a Camden pilot engine, but where it is in the photograph is a real problem. This should be easy: a very unusual building, two brick platform walls, a water tank at the right, and probably a gents' toilet under that roof-ventilator, but the location is as elusive as that of Mystery Photo 85. The “usual five-coach train” was six wheelers. Drawings and more details in the Journal of the Historical Model Railway Society, Volume3 No.3 (1959). 'Premier News', the Society's magazine in the days before the 'Journal', contains a photograph in issue 59 of Jan/Feb 1986 which shows an express double-headed by Problem 165 'Star' and a Teutonic. From the condition of the Problem (round smokebox door, tender coal rails) the date seems to be similar to that of the mystery photo. The caption says that the photograph is in the Society's collection, negative number 1241, and that the location had previously been incorrectly identified as Tamworth, but is actually Lichfield Trent Valley station before quadrupling The mystery photo was taken at the same place, as is clear by details of the platform end, the wall on the right and the chimneyed hut and telegraph pole on the left. The strange station building behind 'Mersey' is invisible on this other photo because of exhaust from the two engines, but the station building on the right has a similar flat-topped brick end-wall. There is also a grand close-up view of a loading gauge. Photo described above added to 'larger photo' selection. A check of the Ordnance plan shows that this is definitely Lichfield Trent Valley station looking east; everything fits. The very recognisable Trent Valley Brewery is just off-camera to the left; if it had been included, this would not have been such a very mysterious photograph! As the Problem ‘Mersey’ and the Whitworth ‘Zamiel’ (Fig 178 in Peter Lee's book) are both on passenger trains, and each has only one headlamp on the left side of the bufferbeam, the date might be refined a bit, to between March 1900 and the end of 1902.